Mars boasts two of the ugliest moons in the Solar System, including Phobos – an oddly shaped, pockmarked moon featuring a distinctive set of stripes. Astronomers have debated the origin of these grooves for decades, but a new computer simulation suggests Phobos’ stripes were made by rolling and bouncing boulders dislodged by a cataclysmic asteroid strike. This moon’s most distinctive feature, aside from its grooves, is a gigantic impact crater known as the Stickley Crater. Phobos measures a mere 27 kilometres (18 miles) at its widest point, yet this crater extends for nine kilometres (5.5 miles). For example, the grooves aren’t all diverging from the Stickney Crater, as might be expected if they were created by the crater-forming event. Also, some grooves are superimposed on top of others, which suggests they formed at different times. Some stripes run through the Stickney Crater itself, which seems to imply that the crater was already in place when the grooves formed. And finally, there’s Phobos’ Dead Spot – an area on the moon in which no grooves exist; if the grooves were caused by bouncing boulders, it seems strange they all managed to avoid this one particular area. Watching the simulation unfold, the researchers saw how the debris moved outwards from the impact site, with the boulders aligning themselves in sets of parallel paths – an observation consistent with the sets of parallel grooves observed on Phobos. Owing to the moon’s weak gravity, however, some of the boulders just kept on rolling and bouncing. In fact, some boulders rolled for so long they actually travelled all the way around Phobos – and then still kept on going. The stunning observation of circumnavigating boulders could explain why some grooves aren’t radially aligned to the crater, and why some are superimposed on top of others. 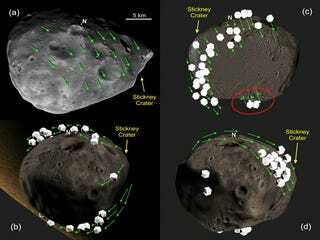 The simulations also showed some boulders returning to their point of origin, which could explain why grooves can be seen inside of Stickney Crater.